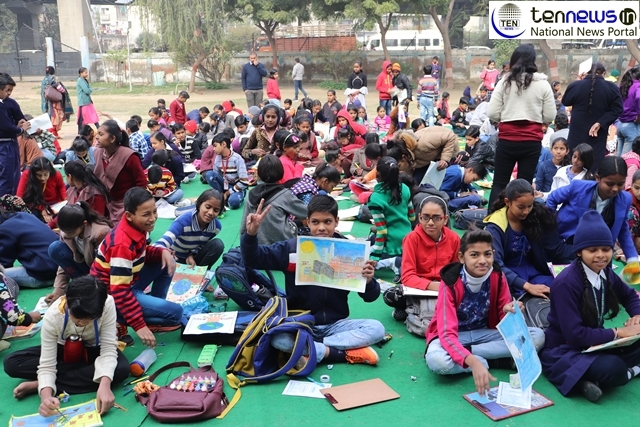 NOIDA, (3/2/2019): Saksham Bharti NGO organises its 20th painting competition today in Saraswati Balika Vudyalaya, sector 31, Noida. A painting competition is organised every year by Saksham Bharti NGO. This competition is mainly for the children studying in public schools and are underprivileged. This painting competition gives a platform to the talent of children who are left behind in the society. It also increases their confidence among themselves. Rajeev Bhasin, Vice President, Saksham Bharti NGO, said, “the main focus of Saksham Bharti is to bring out the talent from the underprivileged kids specially from public schools. We organise this competition every year, so its our 20th year in doing this work and bringing the hidden talent of these in front”.